John Oliver’s HBO show will break from the “Daily Show” format of having segments with other reporters. NEW YORK — For a few months last summer, while its host took a leave of absence, John Oliver took over “The Daily Show With Jon Stewart.” With help from a few ripe news developments, including the birth of the royal baby and the death of Anthony Weiner’s career, the brilliantly goofy Brit killed it. He ranted incisively, he raved from the desk like a scholar of the absurd, and “Daily Show” fans and critics loved him. It was a substitute gig that turned out to be a ripping job audition. When Stewart returned from his movie project in September, he sat down with Oliver, who had joined the show in 2006. “Jon was great,” Oliver recalls. “He said, ‘Let’s try to work out what’s the best thing for you to do as well as or instead of this.’ ” Like the good dad we want Stewart to be, and who Oliver says he is, Stewart ushered another one of his little chicks — after Stephen Colbert, Steve Carell, and Ed Helms — out of the nest. Oliver spread his wings and flew right from Comedy Central to HBO, where his new series, “Last Week Tonight With John Oliver,” premieres on April 27 at 11 p.m.
“Last Week Tonight With John Oliver” will be a weekly satire of the news in front of a studio audience, like “The Daily Show.” But with a longer lead time to prepare stories, no commercials, and no reporters other than Oliver, the series will have a different feel to it. And, perched on Sundays, it will not compete with Oliver’s former employer. The format will be loose, Oliver says, noting in an interview only a few weeks before the premiere that many of the details have not been nailed down. There will be curated footage, pre-taped pieces, on-site reporting, and guest interviews — whatever the news dictates. There may even be room for that most traditional of late-night props: the desk. “Or we might have a breakfast nook,” Oliver says, bursting into his familiar guffaw. Before Oliver joined “The Daily Show” in July 2006, arriving in New York the day before his first appearance, he was an up-and-coming political stand-up in England. He appeared as a regular on a panel show called “Mock the Week,” and he frequently performed as a team with Andy Zalzman, with whom he continues to do a topical podcast called “The Bugle.” When Stewart mentioned to Ricky Gervais that he was looking for a Brit for “The Daily Show,” Gervais said he admired Oliver’s work. Oliver’s Britishness is an essential part of his comedy brand in America, of course, as he turns the degree of his accent up or down — from Dickensian street urchin to Monty Python clown — for effect. He has cultivated a persona — not as thoroughly as Colbert, but in the same vein — who’s a kind of awkward intellectual dope from across the pond. As he appears to be a bit baffled by America and its strange ways, Oliver has an outsider’s perspective that’s invaluable when it comes to humor. Oliver agrees: “There is an outsider mentality as well as a faux authority thing that probably helps me comedically,” he says. Sometimes, he says, he’ll refer to Americans as both “we” and “you” in interviews with American politicians, so they don’t know which side he’s on, to “wrong-foot” them. That’s one of the ways he has gotten painful admissions on record, such as the time on “The Daily Show” when a former adviser to Senate Majority Leader Harry Reid said that success in Washington wasn’t to get legislation done so much as it was to get reelected. Oh, and Oliver also got married in 2011, to married Kate Norley, an Army medic who served in Iraq. They met at the 2008 Republican Convention, when she and members of the group Vets for Freedom helped hide him and his “Daily Show” crew from security. Bodow says that Stewart has a great eye for talent, and that he expects his best and brightest to eventually move on. 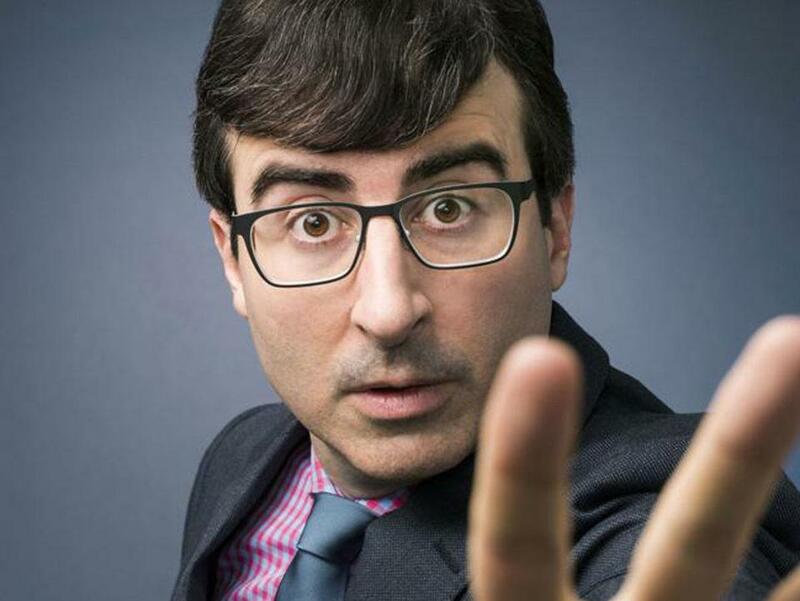 “And John Oliver is as ready for his own thing as anybody getting their own show ever is,” he says.